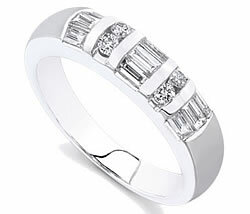 View our anniversary and wedding bands here. One of the best ways to celebrate an anniversary is with a diamond anniversary ring. Diamond rings are something that everyone will enjoy receiving. If your marriage has lasted for a while, you will know exactly what style to get for your beloved. The style that will make her swoon. On your wedding day you made a promise to each other to have and to hold in sickness and in health. Why not show your dedication to your vows with a diamond eternity ring? These diamond rings are the perfect symbol of past, present and future. It shows how much you are looking forward to spending the future with your partner. The tradition of celebrating anniversaries began way back in medieval times. Back then, the only anniversaries that were celebrated were 25 and 50 year anniversaries. At the 25 year mark, the woman was presented with a silver band and at the 50 year mark a gold band. In current times we celebrate every anniversary; although, the big ones are every 5 years. While each year has a designated gift like wood, paper, leather, etc., diamonds are never looked down upon. Diamonds always make a good impression. There are many different styles of diamond rings. One that is an excellent symbol is the diamond eternity band. This fabulous ring is a wonderful gift for any anniversary or other special occasion. It has diamonds going all around the entire band symbolizing eternal love and devotion. A diamond ring of this kind is sure to stun any lucky woman on the receiving end. No matter what kind of diamond ring you decide to choose you may want to have it engraved with a special message. Having your diamond ring engraved adds a personal touch to any ring that you choose. These words of love are the part of the ring that will be next to her skin everyday that she wears it. You should choose a diamond ring that can be worn all of the time. The perfect diamond ring is one that can be worn as easily with jeans as with a fancy black evening dress. There is no better way to celebrate an anniversary than with a diamond ring. If you have an anniversary coming up, start shopping online for the perfect diamond ring.